Yesterday a long time friend donated a large box of new shirts from their embroidery business! They are mostly mens, but a great variety. I hadn't planned on bringing clothing more than coats, but like my friend who lost everything, say yes to everyone's generosity, so I did! I spent the afternoon organizing them by size so it would be easier to give away what was needed. 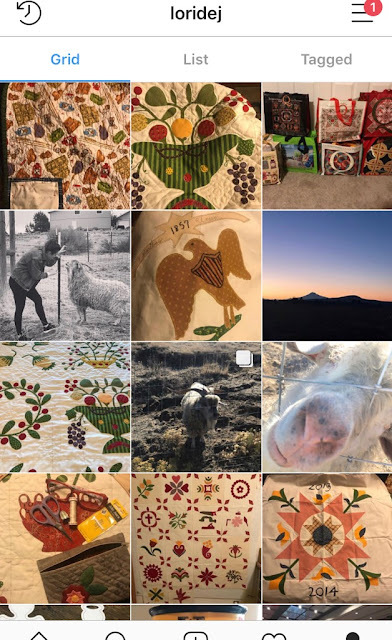 So now, because this is a record of my quilting I am documenting the quilts I am bringing to CA so when and if I start to look for them, I'll have a record somewhere! I washed my quilts before packing them up and although I put in color catchers this one came out a bit more pink than it went in! If you had planned on sending Honey Run Quilters fabric, please hold off. They are overwhelmed at the moment and need to get organized. They are accepting quilts and pillowcases and do have a need for rulers, rotary cutters, mats, thread, pin cushions. I was going to post an IQF finale, but I ran out of day and opted for this easier post. And here is my Instagram post for the week. Make it a terrific weekend!! Last year I helped with bus tours, this year, Jill, on the right, trained me on the first day and then let me go after that. My roommate, Sue, was working bus tours too and I think we made a great team. We had the early bird shift (6AM to gather everything we needed) which was difficult coming from the west coast and pacific time zone. Lack of sleep and we could all get a bit rummy! These aprons are so darn adorable too!! <not!> But they are a great visual for folks looking for the bus tour departure area. Here is our 6:15 office in the Hilton parking garage. Lest you think it is super glamorous, here I am marking new irons with the bright yellow tape and a Q. 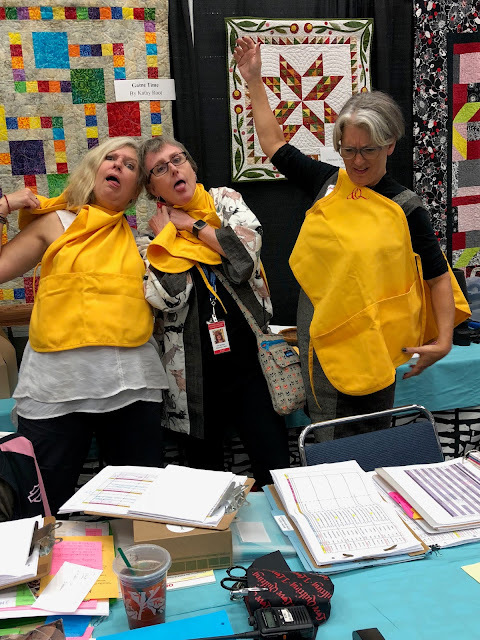 That way we know they belong to Quilts inc ed office. Here we are sprucing up the education office with quilts. This one made by Barbara Black. While checking in a lecture, can I please staple these coupons on? Of course I can! Along with my tour I also took a 3 hour class with Maria Shell. Quilts inc is a for-profit business so we pay for any classes or tours we take. (we work but can take up to 1 1/2 days of classes) Maria's quilts are very recognizable. She shared with us her way of choosing fabric for her quilts. She uses the red plastic thing you look through and the black and white feature on her phone to make sure she has enough contrast. Her way was tedious and I think so much depends on what you are making the quilt for. I'm obviously intrigued by her work because I bought her book! 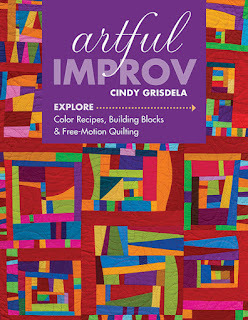 One other lecture I worked and enjoyed quite a bit was with Cindy Grisdela. 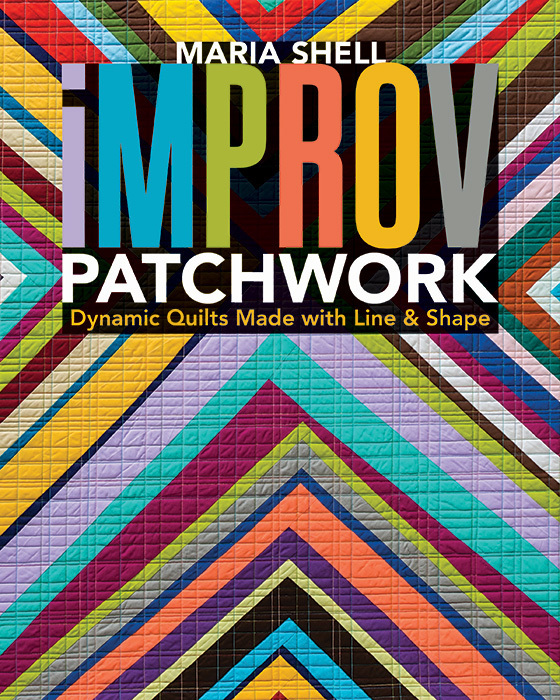 Look at this quilting- a different quilt pattern in each color/section. I bought her book too! I'm pretty sure you won't find me making any art quilts soon, but I can always learn something from them! Our hotel was always a welcome sight, knowing a hot shower and my bed was waiting for me! BTW, This is the Embassy Suites. Such a welcoming room! That is my bag on the right including my clothes and all my purchases and my roommates bag on the left! Her extra suitcase she brought!! Thanks for tagging along with me! Friday I'll finish up with more quilts from the show although I'm sure you've seen plenty online. I hope ya'll are having a terrific week! In Houston I opted for the Texas Quilt Museum and quilt shops tour. I had to go earlier in the week because many buses left later in the week and I was needed to work, not play. Here we are - Let's go! This was our first stop and the employees looked happy to see us at 8AM!! The coffee was hot and cookies and snacks were plentiful. I saw a lot of Laura Heine quilts and patterns, so many in the different shops I thought she may be from Texas. Turns out she isn't! This is so adorable! Love the background print. Even with a bus of 50 it didn't feel overly crowded. The tour guide gave us just enough information to make the time pass quickly, but not so much that we were all falling asleep!! Next stop LaGrange and the TX Quilt Museum. The garden next to the museum is not crooked...just me! hahaha Loved that wall of painted quilts. Look at the library! If you had to do some research, this would be a great place to dig in! I took a sneak peak into a drawer of swatches that Mary and Joe Koval had donated. This is a little cheater cloth. The exhibit was Kaffe quilts and no photos were allowed. I've actually seen quite a few of his quilts at shows and only stayed in the museum about 10 minutes. 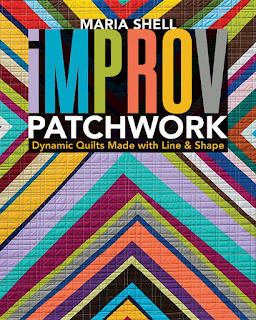 The Quilted Skein was right next door and was tops! It had all kinds of fabric I like so I spent a bit of time in here. We were encouraged to explore the historic square including the courthouse. What a lovely piece of history! I know my courthouse doesn't have a water feature. This reminded me a bit of the mystery house in California! I wonder where that goes?! After a leisure amount of time around town we were to meet for lunch. You could come earlier and order wine or beer. It was a cool old building and the food was top notch!! The business owners use this room for the tour group but they have a little restaurant in LaGrange called Bistro 108. Next we went to a country church. The countryside is dotted with Painted Churches. I think this one may have been a calmer version of some of them. Considering the town this is in is very tiny it is a beautiful church started by Czechs/Bohemia immigrants. I had heard about Buc-ees when I went to TX for the Victoria quilt guild lecture. I heard about it but never stopped, until this bus tour! It's a store, gift shop, deli, food, gas station, rest room all in one that is HUGE! Don't they say everything is bigger in Texas??! One more shop before heading back to Houston. I met some wonderful ladies on this tour and if you are one of them and are reading this, please email or leave a comment! 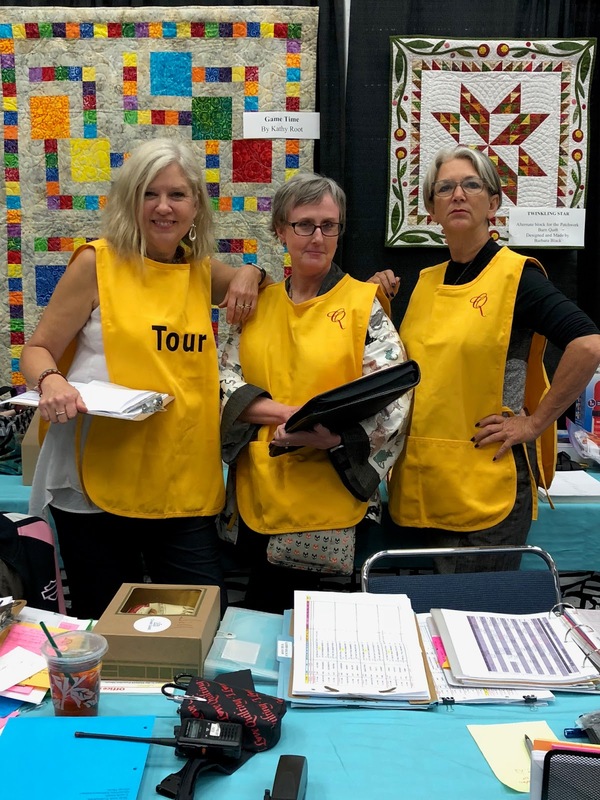 I had a really fantastic time and would recommend signing up for a bus tour if you have time while at the quilt show in Houston! I hope you all had a wonderful relaxing weekend. I know I did. Let's make it an awesome week!